The Colorado Department of Public Health and Environment (CDPHE) has called in an epidemiologist to investigate a recent spike in fetal abnormalities in Garfield County on Colorado’s western slope. Stacey Gavrell, Director of Community Relations for Valley View Hospital in Glenwood Springs, said area prenatal care providers reported an increase in fetal abnormalities to the hospital, which then notified CDPHE. So far neither the hospital nor the state have released information about the numbers of cases reported, over what span of time, or the amount of the increase. Gavrell said it is too early to speculate on the causes of the spike in abnormalities. 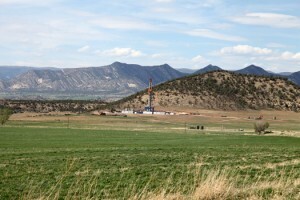 The report comes on the heels of the February, 2014 publication in Environmental Health Perspectives of a study that found an association between the density of natural gas wells within a ten mile radius of expectant mothers’ homes and the prevalence of fetal anomalies such as low birth weight and congenital heart defects in their infants. The study examined a large cohort of babies over an extended period of time in rural Colorado, and specifically controlled for confounding factors that also emit air pollution, including traffic and other heavy industries. The abnormalities in infants in the study are associated with exposure to air pollutants like those emitted from natural gas wells, including volatile organic compounds and nitrogen dioxide. A map of current drilling activity in the Garfield County area shows the number and concentration of active wells along the busy I-70 corridor between Glenwood Springs and Rifle, one of the areas of interest in CDPHE’s investigation.